I hope you have all enjoyed Christmas, I know I do too. Since most of my friends are out of town for two weeks, I'm still here in Montreal, extending my culinary skills, discovering new ingredients and doing lab works. For now, I will be doing the cooking at home. Recently on Foodbuzz, there were quite some recipes using gnocchi and for a while, I wanted to make something with gnocchi. Gnocchi is an ingredient originally from Italy, you can think of as a potato-based dumplings. Like pasta, it can be served in any sauce. This recipe is taken from Robert's Recipes. 1. In a large pot, heat oil over medium-high heat. Add onion and cook until transparent. Add in garlic and cook until fragrant. 2. 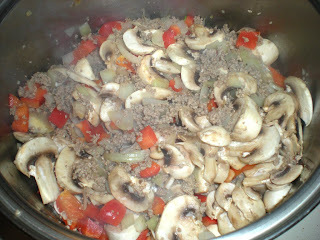 Add ground beef and cook until it starts to turn brown. Add pepper and mushroom, continue to cook until pepper is tender. Drain off excess fats. 3. Add diced tomatoes and their liquid, tomato sauce, bay leaves and seasonings. Bring to boil and reduce to low heat. Continue cooking for 30-40 mins until the sauce becomes thick and liquid evaporates. 4. Meanwhile, cook gnocchi in a pot of boiling water. 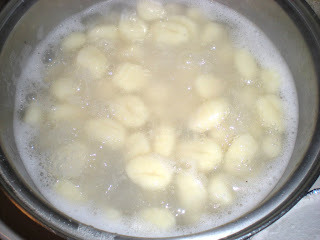 The gnocchi are ready when it starts floating. 5. 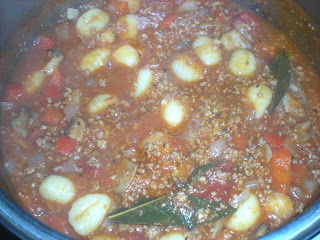 Transfer gnocchi to Bolognese sauce. Serve with Parmesan cheese. Gnocchi has always been a family traditional meal in our household for years. It's one of those recipes I remember from childhood. I just finished a Gnocchi post myself. I'll have to give your sauce a try, it sounds really good. Hope your enjoying your holidays. Happy New Year! That is right up my alley. As soon as I get my hands on some gnocchi I'll have to give this a try. What a delicious dish! Looks so hearty and comforting. Yum. I love a good Bolognese sauce and this sounds delicious. Gnocchi are really very easy to make. I perfer mine made with ricotta--they're very light. You might want to give them a try sometime. That is very interesting Arlene, I never heard of gnocchi with ricotta added. I will give it a try next time. Thanks for the tip. 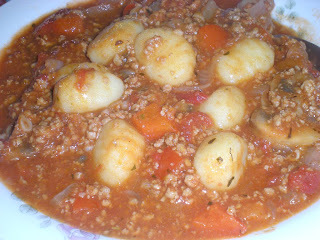 I love bolognese and just recently had it at a restaurant served with gnocchi and really enjoyed the combination. I will definitely give this recipe a try.